Medrol Dose Pack (methylprednisolone) can be used to treat endocrine, nervous system, gastrointestinal, collagen, rheumatic, dermatologic, respiratory, neoplastic, edematous allergic, or ophthalmic diseases. This is a corticosteroid, which is similar in effect to cortisone. The body naturally produces hormones similar in nature and effect to Medrol Dose Packs, but in cases of allergic reactions and other infections your body may not produce enough to stop the negative effects. Medrol Dose Packs are quite strong and there is a large risk of side effects, so you will need to consult with a doctor closely to ensure that your medication is being taken correctly. Medrol Dose Pack, sold under the names Aristocort, Celestone, Bubbli-Pred, Cortone Acetate, Decadron, Cotolone, Deltasone, Entocort EC, Florinef Acetate, Dexamethasone Intensol, Medrol, Methylpred-DP, Prednicot, and Prelone. These are used to treat inflamed areas of the body, including the redness, swelling and itching that is often caused by allergic reactions. In some cases this medication is used to treat conditions like asthma or arthritis as well. Medrol Dose Packs are offered in tablet, delayed and extended release capsules, a solution, elixir, suspension, liquid, disintegrating tablet and syrup. Medrol Dose Packs will weaken your immune system, so it is important to take additional precautions when you are using this medication. Avoid contact with those who are sick or are suffering from infections. Do not use any live vaccines while you are on this medication and inform your doctor about any infections you may already have before you start taking this medication. These types of conditions may become worse when you begin to use your Medrol Dose Packs. If you will be visiting a doctor or dentist during the course of your medication or you may need to visit an emergency medical professional during this time, ask your doctor for an alert tag. This will inform these professionals that you are on a steroid medication and they will be able to react accordingly during your treatment. You should not suddenly stop taking Medrol Dose Packs as this can lead to withdrawal symptoms. Take your medication until the end of your prescription and then discuss with your doctor how best to cease your use of the dosage packs. Do not stop taking your medication in the middle of your prescription unless you experience a serious reaction and are specifically informed to do so by a doctor. Dosing for Medrol Dose Packs will vary greatly depending on what condition is being treated and how an individual responds to the medication. Patients should work closely with their doctors and continue monitoring their progress closely within the first few days of taking Medrol Dose Packs to help ensure that a negative reaction is not likely to occur. Those using Medrol Dose Packs to treat multiple sclerosis will be given 200 mg of the drug in daily doses for a week, which will be followed by doses of approximately 80 mg every other day until the drug is shown to be effective. This schedule typically continues for approximately a month. Most other patients, including children, will be given alternate day therapy. Doses of 2, 4, 8, 16 or 32 mg will be given every six hours every other day to follow the body's natural adrenal rhythm. Your body will need to be monitored before you start your dosage pack to determine if your rhythm lasts for 1.25 or 1.5 days to determine when you should take your doses. Be very careful to take your dosage on the schedule that you have been prescribed. Do not alter the timing or the sizing of your doses for any reason unless given the express order to do so from your doctor. Patients with diabetes will need to take caution when they begin to take Medrol Dose Packs. This medication can alter the blood glucose levels which could affect your treatment of your condition. If you notice that your blood or urine sugar tests are showing abnormal results, inform your doctor to determine whether or not you need to adjust your Medrol dosage. In some cases patients have reported sleep problems, acne, dry or thinning skin, sweating, headache, dizziness, nausea or stomach pain, bloating, or changes in the shape of or location of body fat. These side effects are not necessarily severe but should be reported to your doctor so that they can determine whether or not your treatment needs to be altered in order to help combat these conditions. You should also inform your doctor or contact the FDA if your symptoms are so severe that they interrupt your ability to function. 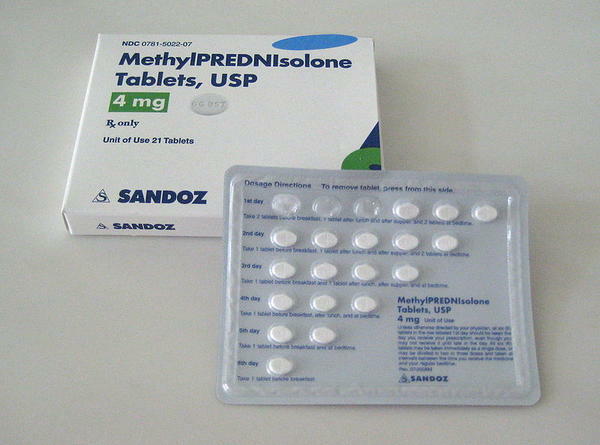 Serious side effects to Medrol Dose Packs include vision problems, swelling or rapid weight gain, shortness of breath, depression, seizure, blood in the stool or coughing up blood, pancreatitis, low potassium, or high blood pressure. Monitor your condition carefully and call your doctor at once if you develop any of these symptoms. If you feel as though you may lose consciousness or your life is otherwise in danger, contact emergency medical services immediately. Some patients have reported suffering from an allergic reaction to Medrol Dose Packs. If you begin to experience hives, swelling of the face, most notably the tongue, throat or lips, or difficulty breathing stop taking your medication and contact emergency medical services immediately. If you have any information regarding your dosage size or the most recent time you took a Medrol Dose Pack, have this information ready when you make the call to assist these specialists in helping you. Some drugs may increase your risk of side effects while taking Medrol Dose Packs. These include aspirin, diuretics, blood thinners, cyclosporine, insulin or other diabetes medication, ketoconazole, rifampin or seizure medications. Inform your doctor regarding any medication you might be taking so they can determine how to alter your dosage to avoid a potentially serious reaction. Some patients who are using Medrol Dose Packs for a long period of time may be asked to follow a potassium rich diet and reduce their salt intake. You may also be asked to add extra protein to your diet and reduce the number of calories you intake daily. These changes are only necessary in some cases and patients should not make any extreme changes to their diet without their doctor's knowledge.